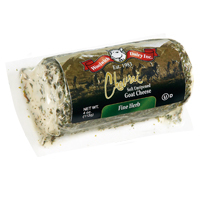 I've tried the regular chevre goat cheese seen in most grocery stores before but have never tried other kinds. I was excited when Woolwich Dairy agreed to send me some of their goat cheese for review on my blog. I was sent the goat cheddar, goat brie, and the fine herb chevrai cheeses. When I received the package in the mail, it was a big surprise because the company generously sent me a case of each of the kinds that I wanted to review! I have goat cheese to last awhile now : ). I love everything that I was sent. My favorite is the goat cheddar. My husband and I have topped venison burgers with it as well as grilled portobello mushroom sandwiches. It gave them extra flavor and melted very nicely. We tried the herb chevrai mixed and melted into whole wheat pasta shells. It was delicious! It was flavorful and very tangy. My husband had never tried goat cheese before and is a huge fan. I was a little skeptical if he would actually like it but he loved it! Here is a little bit of information about the company: "Woolwich Dairy offers more than 50 varieties of cheese products from its 3 manufacturing facilities. More than 150 committed Woolwich employees work diligently to produce the highest quality cheese." I would definitely buy this goat cheese again and am excited to see what other recipes that I can come up with to use it in! I used to raise goats and am addicted to goat cheese. There really is no comparison to other cheeses for creaminess and rich flavor!